Blog Israël in de media: Palestijnse moefti: "Joden zijn de vijanden van Allah"
Palestijnse moefti: "Joden zijn de vijanden van Allah"
"The Jews, the enemies of Allah and of His Messenger, the enemies of Allah and of His Messenger! Enemies of humanity in general, and of Palestinians in particular... The Prophet says: 'You shall fight the Jews and kill them..."
"The Al-Aqsa Mosque is threatened by the plans of the enemies of Allah [the Jews], who have violated all faith and religious laws, and even deviated from their humanity." Als je dag in dag uit met dergelijke retoriek en haat wordt overspoeld, dan ga je het natuurlijk vroeg of laat wel geloven, ook als je nog nooit van je leven door een Israelische soldaat bent vernederd. Als de aan de Palestijnse Autoriteit gelieerde media dit soort troep continu uitzenden, en aan de PA gelieerde moefti's, 'geleerden' en politici het verkondigen, wat zegt dat dan over de intenties van de PA en dus Fatah? Wat zegt dat over hun wil vrede met Israel te sluiten, en dus met de Joden samen te leven en goede afspraken te maken? The Palestinian Authority-appointed Mufti in the Friday sermon from the Al-Aqsa Mosque, called on Palestinians to defend the Al-Aqsa Mosque from Israel's so-called threats to destroy the mosque. 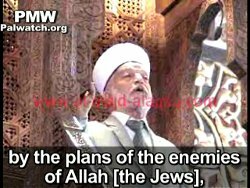 Significantly, the Mufti used the religious hate term, "enemies of Allah," in referring to the Jews. Click here to see the PMW bulletin on PA TV sermon on "Jews are the enemies of Allah and humanity." Last week a PA TV host in a conversation with a child likewise referred to the Jews as "our enemies." The PA Mufti made a similar accusation last month, when he told the PA daily newspaper Al-Hayat Al-Jadida that Israel was planning to destroy the Al-Aqsa Mosque in order to build its "alleged temple" on the ruins [May 22, 2010]. Both Hamas and the Palestinian Authority (Fatah) have generated and sustained religious hatred by disseminating the libel that Israel is attempting to destroy the Al-Aqsa Mosque. This libel is often combined with the call to "defend Al-Aqsa" from the Jews. Click here to view more examples of this recurring libel on the PMW website.